The programme will be sent to schools one week prior to the event. This competition is open to students of secondary age from any SW school and will provide an opportunity for students to use their foreign language out of the classroom. The competition will run in two categories: Non-native speakers and Near-native speakers in KS3-5 but if any categories do not attract sufficient numbers we reserve the right to withdraw them. Students may present at any level in French, German or Spanish. We also accept entries in other languages but we reserve the right to withdraw them if we are unable to find judges. Please download the poster for further information. The closing date for entries is 4pm on Tuesday 31st January 2017. We are very grateful to Oxford University Press for donating prizes for this competition. Bristol French Drama Festival – an exciting and creative project for secondary schools in the South West, organised by Routes into Languages South West in partnership with two enthusiastic and experienced French drama teachers – will showcase short productions prepared by French drama clubs in secondary schools on Saturday 25th March 2017 at the University of Bristol. Foreign language assistants and teachers are invited to organise a French drama club in school for students who are interested in both subjects (French and drama) to run weekly during the lunch break or after school between November - March. They will have 4 months to prepare a 5-10 minute performance on the pre-determined theme - this year the prop to be used is 'flippers'! This will culminate with a fun performance for all – pupils will perform their production on stage and share it with other participants, friends and families at the festival in March! Three prizes will be awarded to winners – for Best Acting, Best Language Skills and Creativity. This is a joint event with a Bristol-based company Theatre VO. To help you organise a French drama club in school, we are holding a training workshop for teachers and assistants, which will give you the confidence and numerous ideas on how to run such a club. The training workshop will take place on Wednesday 16th November at the University of Bristol. If you would like to attend a training workshop please register by following this link by Monday 7th November. 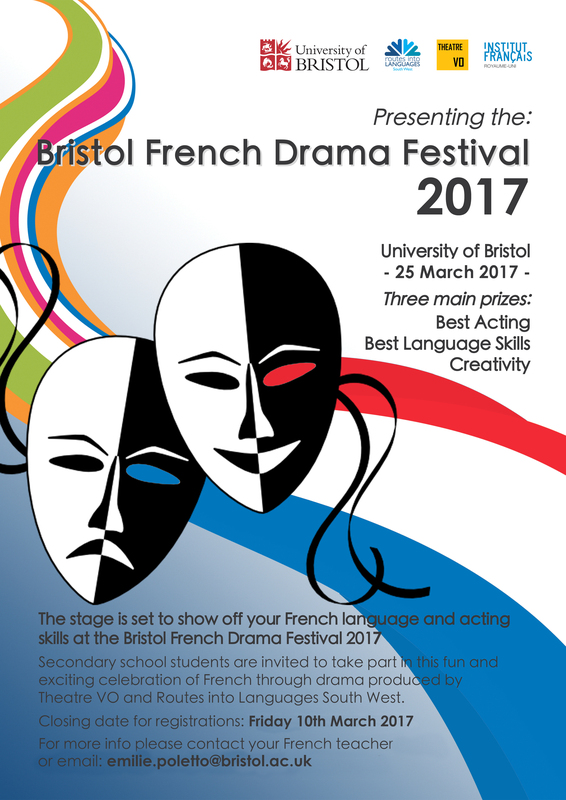 To take part in Bristol French Drama Festival 2017 please register below by Friday 10th March. Download the colourful poster below - please save it on your computer using the option 'Save image as' for it to display correctly. As you will be aware, the central funding for Routes into Languages ceases from 31 August 2016, and in consequence we shall be able to offer only a more reduced regional Routes presence and support in promoting MFL in schools as sadly, the greatest loss to the region is that of our Project Manager Irena Holdsworth. But we are still here! Central Routes coordination now passes to the International Unit of Universities UK, and Bristol and Bath continue to Co-Direct for the South West. The website will continue to offer the opportunity to keep in touch with activities both regionally and nationally, and routes-south-west@bath.ac.uk continues to be a means of contacting us centrally. In addition, Pilton Community College and Bath Royal High School would wish to continue a form of the Speaking Competition, and we shall keep you posted with developments there. After our signature we have attached an amended version of the statement we made at the Celebrating Success event in Bristol at the end of June. We wanted to be as honest yet upbeat as possible in making that statement, just as we are seeking in this letter to reassure you that, despite the current loss of national funding, we remain determined to support you in promoting MFL as best we are able given the new financial situation. Routes lives! Please keep us informed of your activities, and let us know how we might be able to support you going forward.